The Quantum Jumping saddle is built on a close contact tree and panel, it gives a flatter seat required for stadium or cross country jumping. Knee and thigh blocks to support your position.Benefit from a close contact saddle that has flocked, not latex molded panels. The 100% wool flocking allows adjustment for that perfect fit. 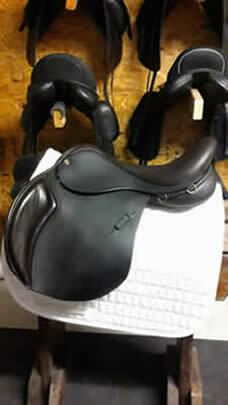 This saddle is a few years old and has only been ued as a demo. Oxblood vintage leather. The Ricochet is an amalgamation of our two most popular jumping saddles; the Quantum and the Wexford.It has a low profile square cantled seat and an aesthetic continental close-contact look – so sought after in the jumping world especially with the Hunter-Jumpers.The panel and tree combination lends itself to many high wither profiles from hunting horses, thoroughbred eventers through to some of the more modern warmblood jumpers. 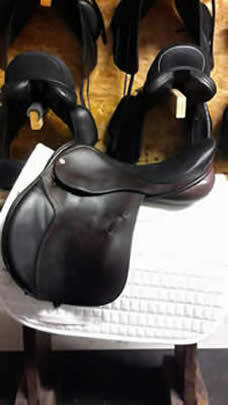 This saddle was previously owned by one person and was well looked after. 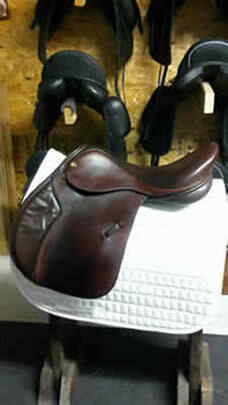 A couple years old but in good condition.Two tone Oxblood skirt and flaps and Havana seat and knee roll. Made with vintage leather, the Solare offers excellent value for money with the saddle combining cutting edge design and technology providing riders of all levels and ability with a close contact saddle and a forward-fitting seat that allows freedom of movement.This saddle has a discreet knee roll providing support without blocking the leg position whilst the forward cut flaps help the rider’s balance and security.The pure wool flocking in this versatile saddle helps to offer the perfect fit and allows greater adjustment options. 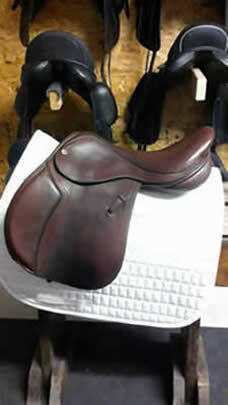 This saddle has only been used as a demo and is a few years old. Oxblood vintage leather.